Yes, this running of the Week in Review is late, but we had a great time these past few days prepping for our very first monthly In Person event. We want to thank David Leitner and Daine Pearson of Cinedeck for their great presentations. Look for Joe Herman’s article on the evening’s events to learn more. Fotokem’s Tom Vice introduces their nextLAB “workflow solution” at NAB. At the show, Tom had set up at Canon’s booth. As part of the roll-out of Canon’s EOS C500 cinema camera, Fotokem demonstrated how its nextLAB system could speed the production and post pipeline for the camera’s demonstration footage used extensively during its roll-out. Digital dailies offer the added advantage of being downloadable, streamable , more easily manipulated and delivered to suit the needs of filmmakers who may be traveling or working in far-flung locations. Fotokem saw a hole in the market as Tom Vice says in the video, for an on-set file-based “telecine”. FotoKem’s nextLAB Mobile handles all the formats you’re likely to come across, including Arri Alexa, Sony F65 and Red Epic. After immediately transferring the data to the Mobile’s storage arrays, the device can then work to sync sound to picture, color correct as needed, apply a LUT, transcode to make deliverables and archive the footage on LTO 5 tape. Creating a relatively compact, rolling cart device brings the process of dailies to just about any location. The Fotokem system, like others from facilities including Level 3 Post, allow you to stream selected dailies to a web site for further delivery. As Tom Vice says, the cart is a single tool that replaces multiple ones that were previously necessary. In a June 16th article by Variety’s Karen Idelson, she points out some of the downside of such an all-inclusive device. One unhappy result of introducing new gear that does more with less resources is that post houses miss the higher charges in-house dailies creation can extract from a production. Meanwhile, since that roll on cart might be run by a less than fully qualified techie–as against the (usually) fully vetted staff at a post facility—a production might be opening itself to a considerable downside if, for example, a critical backup is flubbed. Sources say Adobe is the major force behind the creation of the HP-Z280 RED workstation. If you look around these days, it seems that many more people are realizing the benefits of Windows-based workstations in high-end postproduction and editing. If you want to get more specific, HP’s workstations, in our opinion, continues to deliver the goods. 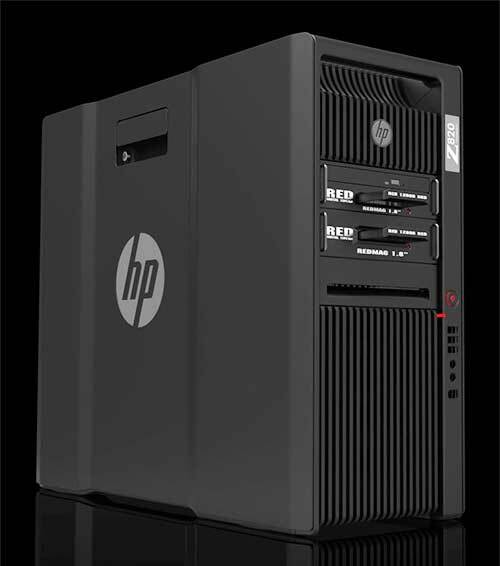 We gave HP’s mother of all workstations, the Z820, a special NYCPPNews Editor’s Choice award for excellence. You can read the review here. Now I recently learned of a specially configured release of the HP Z820, the RED Edition, coming next month. Jarred Land, RED president, let the production world know about the machine in this post on the main RED blog. HP installed two custom RED MAG card readers into the front of the machine. You’ll also find an internal RED ROCKET acceleration card plus a tuned installation of Adobe’s CS6. As said by Land, “These things scream”. The rest of the specs are hot too. You will be able to fire up two eight-core E5 Xeons (total 16 Cores), up to 512 GB of RAM, Nvidia Quadro 5000, 10K RPM boot drive, multiple RAID options, an Internal BluRay drive and of course the RED MAG card readers. This machine will seriously kick your Red workflow in gear. Sold through production-oriented resellers such as ProMax and TEKSERVE, HP RED systems start around $10,000. It’s actually funny to read the entire thread. I’m struck by how many post production professionals are confounded by the idea of switching platforms. It’s rather too much like switching religions. It’s also interesting to read Mr. Land’s perception of the workstation landscape. It’s eye opening in its depiction of the changes towards the PC. It justifies my own perception, which has developed over time. Personally, I’ve been using Windows workstations for about ten years. I switched from the Mac just prior to Apple’s moving to Intel chips. Adobe had already released After Effects on the PC, which is one of my main go-to apps. I guess I was just ahead of my time. Don’t get me wrong. I love Apple. Their products have been great over many years. At one point before I switched, I was probably the most Mac-centric guy you would ever meet. I also think the iPad is one of the most innovative computing devices ever. I’m crazy about iPads and love iPhones as well. It’s just that one day back in the late 1990s, I had tried After Effects on a Wintel machine for some serious production duty. I noticed that it was a lot faster. So a couple years later, I bought a PC. In those days, I wasn’t doing that much editing, more compositing and 3D. If I was a Final Cut user, things might have been different, but I wasn’t. Today, I am doing a lot more editing, but in case you haven’t noticed, the PC has turned into a great editing platform as well, with both Adobe and Avid’s new releases. The religious nature of the Mac vs. PC is old news, of course. But I still don’t know why people make such a fuss about it. It’s simply amusing to read one of the comments in the REDUSER thread (above) that going from the Mac to Windows is like “switching to the dark side”. I think of it more positively: I feel like I’m building my own droid. I have enjoyed using Windows over the years, first with XP, and now Windows 7, which I think is a great OS. What more do you really need from an operating system anyway besides a place to store your files, a way to search for them, to run a few apps and an environment to surf the web? In fact, I personally think that the more transparent the OS is, the better off you are. I want the operating system to practically disappear when I’m working. I could probably do fine with a few icons and a cursor. Everything else, I can do inside a web page. No, you don’t have to be a Republican, right-winger, banker, or narrow-minded conservative to own a PC. Just as you don’t need to have tattoos, orange hair, ride a skateboard or bang a drum to use a Mac. All that stuff is mythology. Just get a machine that does what you need it to do. However, I find that, because of the competition on the hardware side, it is often cheaper to configure a production-class PC workstation. Thankfully, we have a choice, and some will always be willing to pay more for what they perceive is better. Mac or PC? Whatever works best for you. In any case, with all the questions swirling around Apple’s plans for the Mac Pro towers in 2013, this new HP z820, RED edition with Adobe CS6 pre-installed sure looks sweet to me.